Or so it’s commonly thought. But we beg to differ. 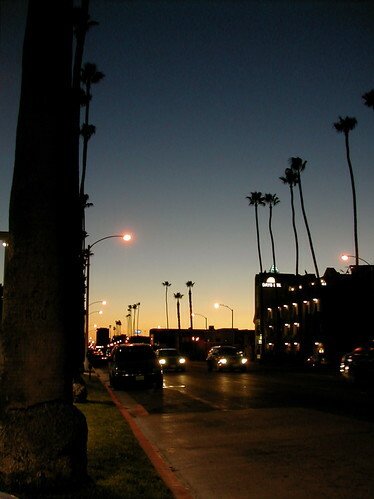 Los Angeles is quite a walkable city, and where we live, at the border of Los Angeles and Santa Monica, is particularly pedestrian-friendly. So when jojoebi of jojoebi designs suggested a global neighbourhood photo journal series, we put on our walking shoes and trod the sidewalks to show you our neighbourhood. 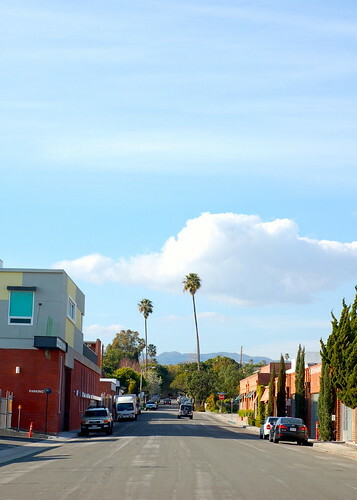 An apartment block in Los Angeles. 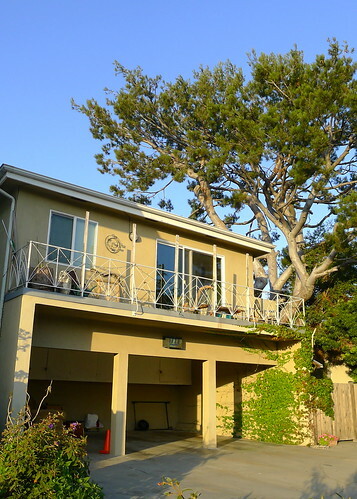 A colourful house in neighbouring Santa Monica. Looking up the street towards Brentwood, another neighbourhood to the north. A postbox. I’m not sure if it’s happy or sad. 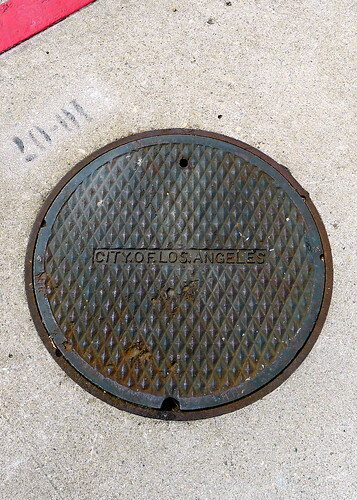 Manhole covers in LA are utilitarian. 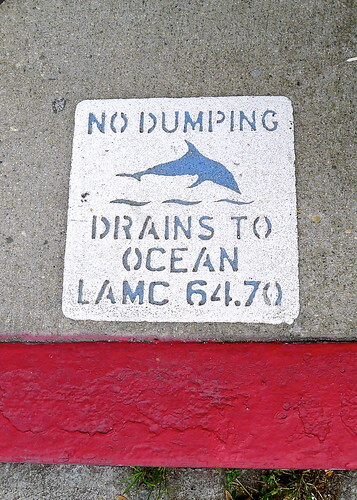 But the “no dumping” signs by our drains are very marine! This is the big blue bus that I take to work everyday. 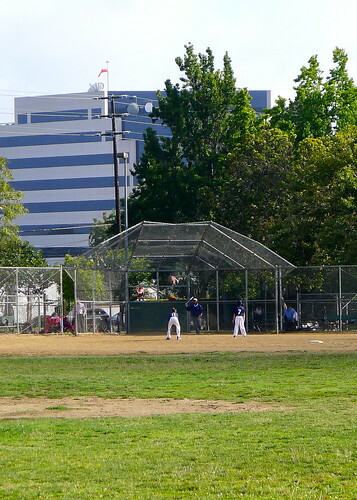 Our local park, Stoner Park, with a baseball game in session. The children’s playground at our local park. 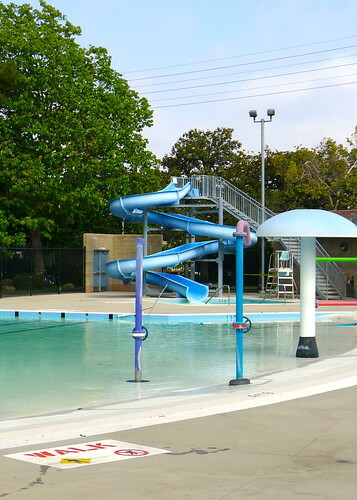 The water playground in our local park, which I’ve never seen in use. We’ll have to find out how to get in this summer! 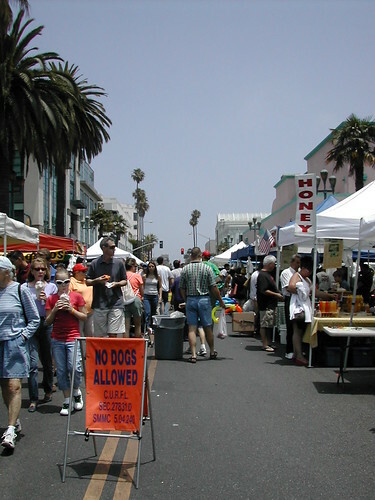 A Farmers Market in Santa Monica. 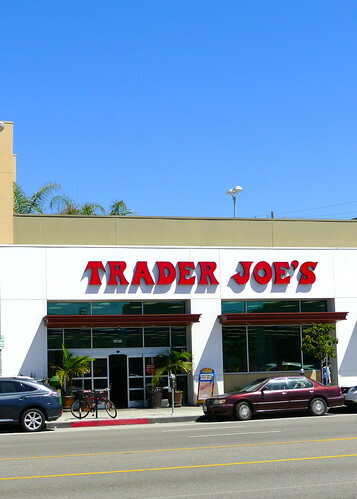 Our local shop, Trader Joe’s. It has a nice selection of fresh produce, and a deadly snacks section. 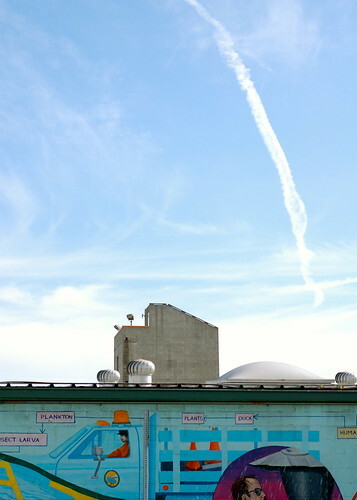 The Santa Monica recycling centre has a colourful mural describing the life cycle of our waste. We hope you’ve enjoyed a tour of where we live. Below are links to the global tour, so check them out in the coming days! 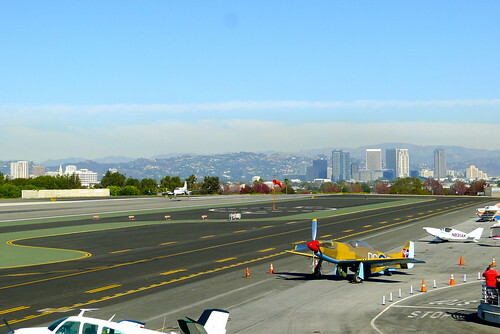 The runway at our local Santa Monica airport, with a view of Los Angeles. 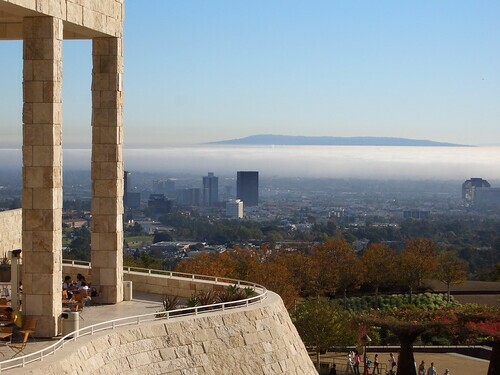 And how Los Angeles looks from the Getty Museum, which we love to visit for its amazing photo exhibitions. This entry was posted in akatsuki snaps, akatsuki travels and tagged los angeles, neighbourhood tour, osanpo, photo journal, santa monica. Bookmark the permalink. wow, everything looks so big and wide! 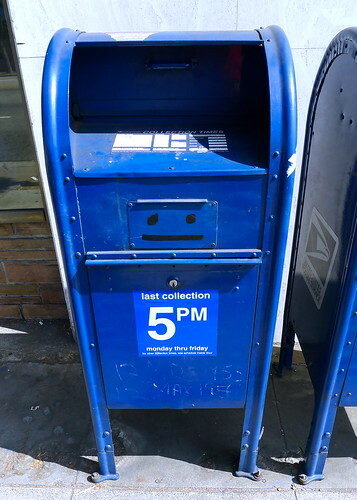 Are all mail boxes in the US blue? The roads are much wider here and have more lanes. 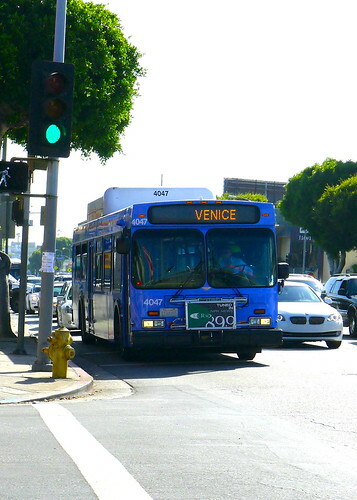 LA is a very car-centric city. 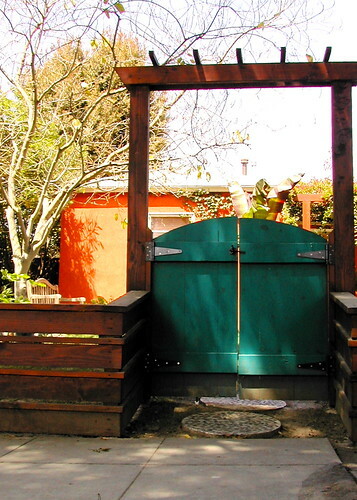 And as far as I know, the blue mailbox is the standard. We’ll find out when he other USA wanders are posted! Thanks for the invitation; I’m looking forward to seeing the other photo journals! Thanks Zonnah! I’m looking forward to your tour of Washington! I love the “no dumping” sign too! It makes up for none-too-exciting manhole covers around here. And I think our own neighbourhoods always seem boring to us because we see them everyday. I’m looking forward to checking yours out! That’s true! I hadn’t noticed the frequency of blue in our neighborhood. 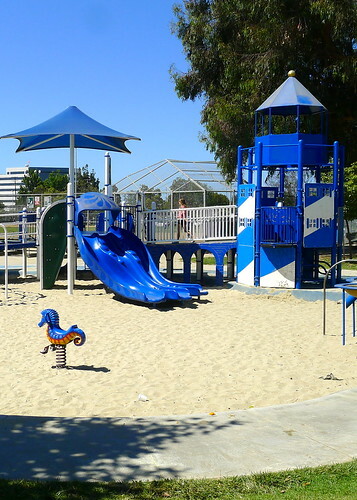 LA can seem very monotone because of the buildings, but our gardens and parks are pretty colourful.